From Goodreads –Lucy is seventeen when she discovers that she is the latest recipient of a generations-old family curse that requires her to complete three seemingly impossible tasks or risk falling into madness and passing the curse on to the next generation. Unlike her ancestors, though, Lucy has family, friends, and other modern resources to help her out. But will it be enough to conquer this age-old evil? 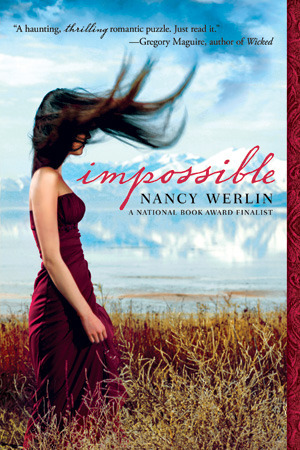 A beautifully wrought modern fairy tale from master storyteller and award-winning author Nancy Werlin. Inspired by the classic folk ballad “Scarborough Fair,” this is a wonderfully riveting and haunting novel of suspense, romance, and fantasy. So, I might have difficulties expressing how much I enjoyed Impossible, but truly, this book is fantastic. It’s a surreal sort of fairytale with a contemporary setting and wonderful, likeable characters. If you read Impossible solely to meet Zach, you will not be disappointed. Recommend! Have you read Impossible? Thoughts? Do you have a favorite modern fairytale? Glad to have won you over with my weird review, Jaime. 🙂 Aren’t husbands fun? IMPOSSIBLE was definitely a different book than I’d anticipated… I enjoyed it so much more than I thought I would. Nancy Werlin’s writing is lovely, and Zach… Loved him! Ha! I could totally see my husband reacting the same way, when I try to describe why I love a book. Once in a great while he’ll ask me what a book is about, if he sees me frantically flipping pages and snarling at the kids to back off. Then I figure it’s good time to practice twitter pitches and I try to tell him two sentences, ’cause by three I’ve lost him! What intrigues me about this one are the supportive foster parents and the crazy mom! I’ll definitely check out your review, and yes, please do give IMPOSSIBLE a read. I thought it was a lovely, lovely book! LOL at the convo with your hubby! I read IMPOSSIBLE several summers back. It’s a good one. Glad you liked it! This sounds like a lot of conversations at my house. I got a good chuckle over this post. AND I’m adding it to my list. This books sounds strangely wonderful. I’m intrigued by folk and fairy tales but find I don’t read many. Thanks for this recommendation! Katy, you’re so awesome, I sure have missed you and your posts. Glad I’m back to blogging and catching up on posts like these 🙂 Also, Impossible sounds out of the ordinary and rather strange but from your raving, a good type of strange. Thanks for putting the book on my radar! Aww, thanks, lady! Glad to hear you’re back to blogging… looking forward to checking out your posts. I hope you get a chance to check out IMPOSSIBLE!